Hey Suzanne. Thanks for taking the time out to talk to me about your new film, ‘The Lords Of Salem’. Hi Matt. This is great. Thanks for asking! Heidi, a DJ at a local Salem radio station and a recovering addict, receives a record from “The Lords”. Upon listening to this LP, strange things begin happening to her and to other women in Salem. The radio station gives away tickets to a concert featuring The Lords to be held later in the week. Heidi shows up at the venue where her life is changed forever. Elizabeth Jacobs is one of the witches in Margaret Morgan’s coven in Salem. Her family came over from England in the mid-1600’s. As a young woman, she was a healer using herbs and natural methods to help people, but people soon grew suspicious of her. She hid out in woods and her family brought her food when they could which wasn’t often. Elizabeth stumbled upon Margaret and Sarah Easter and the three lived together, hunted and stole food, gathered and grew vegetables. They also began sharing . . . information about healing, spells and Satan, and intimacies. One at a time, other women found us and our strength grew. Elizabeth loved Margaret (as did all of us) and would do anything for her. 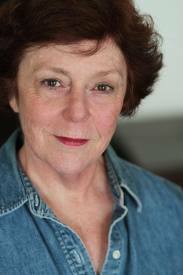 I responded to an online audition notice posted by Monika Mikkelsen, the casting director, and was called in to read. Although the lines weren’t in the film, Shakespearian-style dialogue was used for the audition to give us an opportunity to show our range, understanding of the material and our abilities in situations similar to those that were in the film. I really connected to the grittiness and strength of this character. ‘The Lords Of Salem’ uses a lot of archetypal imagery. That’s why it’s such a personal movie to the viewer. Those images strike different notes in each individual viewer — some love the film; some are “meh”; and some hate it. It’s also a film that doesn’t wrap things up neatly; it gives the audience the opportunity to chew on it and form opinions about what happened and why. Personally, I equate Rob’s work in this film to Federico Fellini’s. I worked primarily with Meg Foster, Flo Lawrence, Bonita Friedericy, Brynn Horrocks, Nancy Linehan Charles and Susan Gray – my sister witches. Meg was fearless and set the tone for us. Our scenes felt like a collaboration, something we all created. Also, I loved being burned at the stake ~ not something one says often! I could do anything I wanted and I went for it. And Rob pretty much gave us free rein to be the characters; only occasionally giving us direction. Rob, the cast and crew were great. For one close-up, the camera operator took the time to walk around the fire circle to tell me I was moving my head too quickly for him to get a clear shot of me. And the physical challenges also helped us connect as a team ~ the night shoots and the freezing cold weather. Rob made sure we were well taken care of with huge full-length down parkas when we were off-camera. That kind of care and concern permeated the set. I’d work with Rob, his crew and the cast again in a heartbeat. Let’s talk a bit about you Suzanne. What made you want to get into the acting industry in the first place? I began acting in school plays at the age of 5 and just kept on doing theatre through school and beyond. As a young woman I moved to San Francisco where I began doing film, television and commercials along with theatre. I love creating characters who live in realities different from mine. I love the freedom to explore emotions and situations I don’t meet every day or ever, in some cases. And I finally moved to L.A. about eight years ago to see if I had what it takes to actually work in the business. Well, Meg Foster immediately comes to mind. She has a natural ability to really connect with you and make you feel at ease with her and trust her. Robert Catrini in ‘The Debt Collector’ – winner of the Best Action Adventure Film award at 2011 ComicCon, directed by Alan David Morgan – he is also in ‘G.I. Joe: Retaliation’. Robert is a very talented actor and modest man. Easy to work with, easy to talk to. Hmm trying to think of stories, but not coming up with any. Dropped it in the dishwater recently. Let’s see . . . it still works! Soundtracks: Chicago, A.I. : Artificial Intelligence, Jersey Boys. Frank Sinatra. Shall We Gather At The River (hymn). EMDR sounds. Grace by Snatam Kaur. James Taylor. Rascal Flatts. Bruce Springsteen. Christopher Williams. Red Sky by Thrice. Judi Dench — she seems so gracious and, I think, would be a lovely person to know. Also, to pick her brain about moving forward in this business. My mother, Rosemary Wamsley. She died last year and there’s so much I want to ask her and say to her. Princess Diana — She was inspirational and gave so much of herself in service to others. Was searching for meaning in her life. ‘The Best Exotic Marigold Hotel’. Because I love Judi Dench, Tom Wilkinson and Maggie Smith. Because it’s a beautiful story beautifully told about real people finding hope and love in the second part of their lives. I also liked ‘Skyfall’ and ‘The Dark Knight Rises’. Several things. What I know: I’m writing something for the web; and will be auditioning for Theatre of NOTE’s – (Los Angeles) upcoming season. What I’m working on getting: a role on ‘Game Of Thrones’. What I’m open to: anything! Previous Gary-7 – (Star Trek Into Darkness – 2013). Next Yinka Adeboyeku – (The Reluctant Fundamentalist – 2013). It is great to hear about Suzanne’s experience in the film, and her viewpoint. I know how talented you are as an actor Suzanne, but I also love your writing style, and way of expressing things. Thank you Matt, for presenting this wonderful interview! Suzanne is an inspiration for many of us in Los Angeles. Can’t wait to you see you in action, Suzanne!